My mini rosette badge on this card is inspired by the tradition here in Ireland to wear a rosette badge on St.Patrick's Day. It was a pretty quick card to make too. Starting with a basic white square card, I put a smaller square of green card. On top of that I added a square of white paper and stamped the top section in a repeat pattern using the large shamrock stamp in emerald green. On the bottom section I stamped the mini shamrocks in a repeat pattern using the same green. I crimped an inch wide strip of the same green card and glued this to the card where the two stamped sections meet. I added a strip of ribbon on top of this. To make the rosette, I used two lengths of the satin edged green ribbon, I folded each end point into the centre and glued them down. I added this to the card. I cut out a small white circle of card. The mini-rosette is a narrower strip of crimped card gathered into a circle and glued. 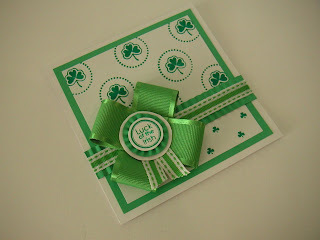 I stamped the text 'Luck of the Irish' onto a piece of card and glued this in the centre of the rosette. I added two pieces of the stitched ribbon as the tails of the rosette. I added these elements to the card. Studio G Designer clear stamps, Impress Dye Ink Emerald.